With houses as an example we can establish what has been informally called an output's rational quantity. If houses have two share limits of 15,000 units and 25,000 units then 15,000 units is therefore the ecological limit. Assume that, by applying our method for maximizing gains, we determine that the optimum quantity for houses is 40,000. Houses therefore have an ecological limit of 15,000 and an economic limit of 40,000. If we exceed 15,000 houses we will potentially cause our economy to exceed its budget for forest habitat destruction, so this is the quantity for which our economy should aim. But what would happen if we change the way wood is extracted, thereby reducing habitat destruction and increasing the ecological limit for houses to 60,000? In that case the output quantity could rationally rise to the optimum quantity of 40,000, but no further. Even though we are now "permitted" on ecological grounds to produce 60,000 houses, we should nevertheless aim for the economic limit of 40,000 houses. If the output’s ecological limit is lower than its optimum quantity, the ecological limit should be chosen because a higher output level is unsustainable. If the output’s optimum quantity is lower than its ecological limit, the optimum quantity should be chosen because a higher output level will result in health losses. The term used in ENL to designate the lower of these two limits is the final output's target quantity. This output level is rational in a sense that precisely reflects ENL's ethical principle: it maximizes the health of present humankind while maintaining the natural conditions for the health of future humankind. By combining the methods for maximizing human gains and respecting environmental constraints, this result identifies the unique quantity that an economy should strive for with regard to each output it produces. 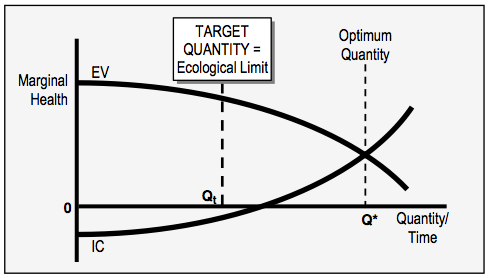 The following figure depicts the case where the ecological limit Qt is the lower of the two limits. The target quantity for an output is the lower of its ecological limit and its optimum quantity. This quantity maximizes the health of present human beings without endangering the health of future human beings. "EV" and "IC" indicate effectual value and input cost respectively. In this situation output quantity should increase to, but not beyond, the ecological limit. If production is lower than this, some potential health will not be realized for present humankind, thus hurting both present and future generations. If production is higher that this, we risk environmental degradation, thus undercutting the basis for future health. The output's target quantity Qt is therefore its ecological limit Q*. The second possibility is that the optimum quantity is lower than the ecological limit. This is shown in the following figure. 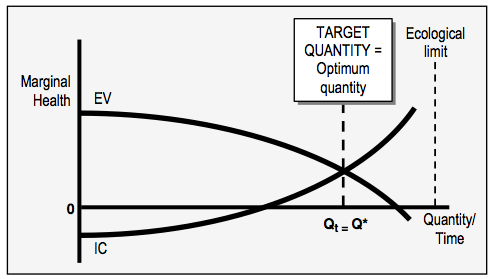 Here the situation is reversed from the previous figure: the optimum quantity is lower than the ecological limit, and the target quantity is therefore the optimum quantity. "EV" and "IC" indicate effectual value and input cost respectively. In this case production should increase to, but not beyond, the output's optimum quantity Q*. If production is lower than this, present health is not maximized. If production is higher we will initially incur losses, and we will eventually risk future health if the ecological limit is exceeded. The output's target quantity in this situation is therefore its optimum quantity, or economic limit. The same reasoning can be applied to an economy's total outputs, thus giving us the economy's target scale. The concept of economic scale fails to discriminate among outputs according to their health effects, and this target should thus be considered an immediate rather than an ultimate objective. Nevertheless, if practical circumstances prevent us from dealing with each output individually, the next best approach is to move the economy's current scale to its target scale, thereby maximizing our society's health under prevailing conditions. Optimization must be considered both in the short run, when value and cost remain fixed, and over the long run, when these factors can change. This applies here as well. In the figure immediately above, for example, reduced output maldistribution will shift the effectual value curve up and the optimum quantity to the right. This will increase the target quantity until the ecological limit is encountered. Reduced maldistribution of labor or wastes will shift the input cost curve down, again moving optimum quantity to the right and increasing the target quantity.